A Polygon is a two-dimensional figure that is made up of multiple straight-line segments. In Geometry, Octagon is also a polygon with eight segments and length of each of the sides would be equal. Further, measurement of each angle is also the same in the case of Octagon. This is a regular octagon whose sides are congruent. Each of the interior angle and the exterior angle would be measured as 135-degree or 45-degree. In case of the regular octagon, there is a complete set of predefined formulas to calculate its area, perimeter, and the side length. You just have to put the values into the formula to compute the final outcome. This special polygon has eight sides and eight angles. The length of all eight sides would be equal and measurement of all eight angles is also the same. If you will draw diagonals then they are total twenty in the count. If you add up all interior angles then it will make 1080 degrees and individually each angle is measured as 135 degrees when divided by 8. If you add up all exterior angles then it will make 360 degrees and individually each angle is measured as 45 degrees when divided by 8. Octagon is a polygon with eight sides when all these sides are equal it becomes a regular octagon. The smallest polygon in mathematics is Triangle. This is a closed two-dimensional figure and interesting to study by students for early school or competitive exams. Let us see how to calculate the area of an octagon so that you can solve most complex problems by putting values into the formula. The area is defined as the region occupied within boundaries of an octagon. 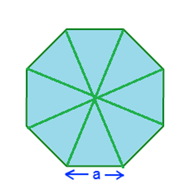 To compute the area of an octagon, we first need to divide the octagon into small isosceles triangles. Now, calculate the area of one triangle and multiply the value by eight. 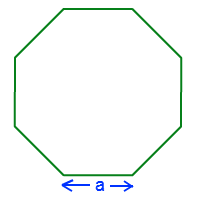 a is the length of any one side of the octagon. The eight-sided shape i.e. Octagon has multiple applications in real-life too like the architect, engineering, or nature etc. Keep in mind that an octagon should always have curved or disconnected lines otherwise it could not be closed together. Consider a stop sign that is octagonal in shape. Even houses in North America once made up of octagonal shape because they were considered cheap and best option. The applications of the octagon are still appreciated in multiple areas of life.